Powerful Streaming System for Multi-Signal Capture, Encoding, Live Broadcasting and Webcast Recording. Mobile Power System: Quiet PC system with high computing power. Very light and robust housing with integrated full HD screen. Fully mobile. Complete with mouse, keyboard and sturdy transport bag. IMS Webcaster Software: Equipped with professional IMS Webcast and IMS Streaming software, including RTMP and IP network streaming & encoding technology. Includes Premium Support: 12 months personal support and update service. Equipped with powerful and reliable capture systems. 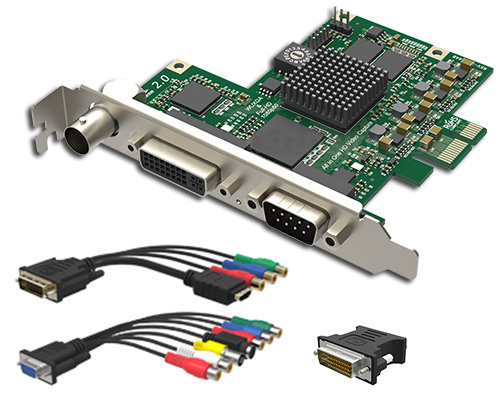 Two PCI Express Capture cards allow you to connect almost any media source and various audio options. Signal Switch: You can switch between several adjoining signals. Auto Detect: Incoming signals are detected automatically and, in the event of a signal failure, an automatic search for available signals will be carried out. Capture Input: Each card can handle one of the following formats.